reveals the organization of the entire tapestry. " Such a lovely thought from one of the greatest physicists of our time. He died in 1988, the year another young man I know and love was born. As the DA grew, so did his joy for learning. 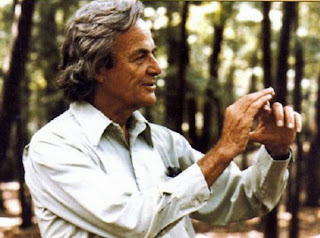 He introduced me to the life of Richard Feynman, a man who won the nobel prize for quantum electrodynamics at the age of 47 and who was reknowned for his work on the atomic bomb project in Los Alamos. Yet in spite of his intellectual and scientific accomplishments, Feynman was a fascinating fellow who was playful and curious with a great love for life and learning. I found Dr. Feynman had a most interesting outlook on life and I read many of his books in spite of my lack of skills in either physics or math. There was so much more to him than that. A wonderful introduction to the man is his book " Surely You're Joking Mr. Feynman " which is a lighthearted and entertaining insight into his life.